Potato (alu) : 1 nos. Take a pan and heat oil. Fry kaaju until golden brown remove from the oil and keep it aside. Add rai , urad dal chana dal to the oil. 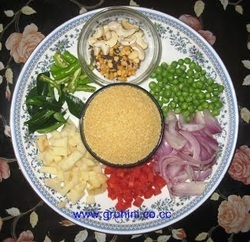 Let rai splutter add chopped onions, alu, carrot, green peas, curry leaves and green chillies. Stir, add salt and cook in a medium flame for 2 to 3 mins. Add Daliya and stir. Add 2 cups of water. stir and close the lid and cook for 10 to 12 min. in a low flame until upma is done. Tasty Daliya upma is ready...........Take it into a serving bowl garnish with kaaju and fresh coriander leaves. Serve hot with any chutney or pickle.